Healthy Choice is a brand of delicious frozen food that fuels a healthy lifestyle. The meals cater to people looking for healthy, fresh-tasting and convenient food at a great value. The brand has been in existence for 20 years and is owned by ConAgra Foods, owners of more than 50 different consumer-facing food products, in the frozen, snack, and ingredient categories. To extend the reach of free public profile that enables companies to share their business and products with Facebook users to increase engagement. Distribute coupons to its Facebook community in an effort to promote the brand’s reputation for good value. To distribute coupons – with a twist – and promoted them through status updates, community outreach, and a Facebook Ads campaign. The company offered Facebook users a “progressive” coupon. Earlier it was limited but later company increase it’s value, from $0.75 to $1.50 to a buy-one-get-one-free deal. This of course encouraged users to share the coupon with their own Facebook communities and allowed Healthy Choice to tap into the viral, peer-to-peer promotion that Facebook affords. Using the interaction tools inherent in Facebook, Healthy Choice, supported by public relations firm Ketchum, spread news of the coupon to the existing community and to bloggers with whom the brand already had strong relationships, as well as the brand’s email database. This outreach built on previous coupon giveaways executed by the brand and allowed bloggers to spread the word on behalf of the brand, while reaching existing consumers of Healthy Choice products. 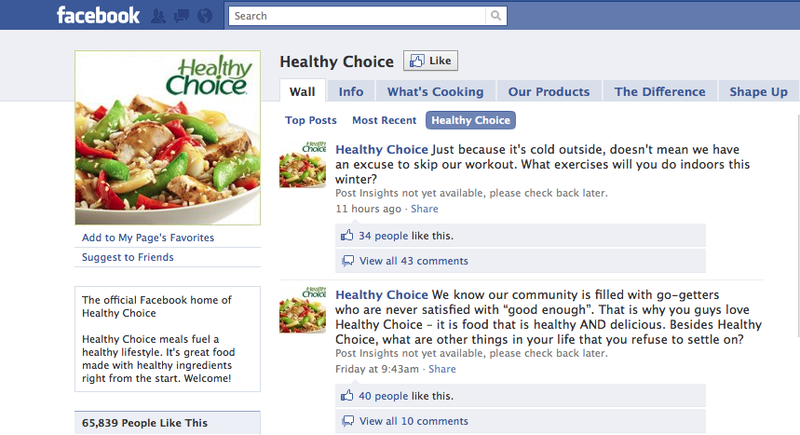 Healthy Choice ran two series of Facebook Ads. One is Premium and Marketplace Ads for a week and another series of Premium Ads. The Ads publicized the progressive coupon offer and then brought people to Healthy Choice’s Page, where they could click to like it and then sign up for the coupon. Healthy Choice took advantage of Facebook’s anonymized and aggregated data to target its desired audience. It reached people who might already be Healthy Choice consumers as well as people who were likely to become customers. This was achieved by using two keyword target segments: healthy eating keywords, such as ‘vegetables’, ‘healthy living’, ‘healthy gourmet’ and ‘salads’, and convenience keywords, which included several popular, healthier fast-food brands. In addition, the company targeted women aged 18 and above and did not specify geographic location to reach as many people in its target group as possible. When the coupon reached its maximum value, Healthy Choice changed the copy in the ads to remind people of the great deal available and encourage them to sign up. Approximately 6,800 people had connected to Healthy Choice’s Facebook Page when the campaign began on October 12 2010. At the end of the two-week campaign, almost 60,000 people had connected – an increase of approximately 900 percent. Users’ engagement with the Healthy Choice Page increased threefold. 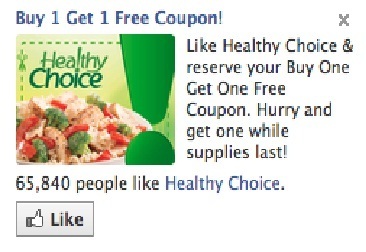 Now, each new post from Healthy Choice generates three times as many responses as it would prior to the coupon campaign. Healthy Choice distributed 50,000 coupons. The ads received 11 million impressions, in addition to 3 million organic and brand-driven impressions for Healthy Choice. 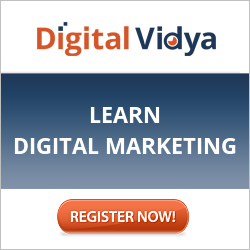 The ads had an engagement rate of 0.261 percent. Users were given the option to sign up for Healthy Choice’s email newsletter when registering for the coupon and 60 percent of users opted to join the mailing list. “That is above average for an email acquisition campaign and this was not necessarily designed as an email acquisition campaign. That was an unexpected and very exciting result,” Genevieve explains. Good one..Did they run similar campaign on other social media platforms. Good one.. Great example of how you anchor your facebook promotion around a contest. Thanks for sharing!